DUBAI, UAE, Dec. 12, 2017 /CNW/ – The first Dubai Modest Fashion Week (DMFW) set on Burj Park-Downtown Dubai . The two-day style event that took place across the 8-9 December saw established and emerging designers from over 20 countries take part in 40 fashion shows, with 50 brand booths, workshops and talks, fashion and art exhibitions plus 100 celebrities and influencers, gather at the city’s famous Burj Park – Downtown Dubai to showcase the latest modest fashion trends. From H.E Sheikha Hend Faisal Al Qassemi, Arab superstars Diana Haddad, Hisham El Hajj to Bollywood Diva- Gauahar Khan. DMFW is organized by Think Fashion (led by Franka Soeria and Ozlem Sahin) and Red Connect (led by Arif Ebrahim). The event line up of amazing designers from 5 continents; Modanisa as the name sponsor presents high-end designers Rasit Bagzibagli, Muslima Wear and Selma Sari. 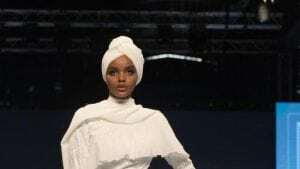 Impressive show from Wardah Beauty presents famous modest fashion designers Safiya Abdallah of Dulce by Safiya, Zaskia Sungkar, Norma Hauri, Ria Miranda and ETU. Ajmal Perfumes presented ready to wear collection of Annah Hariri and bridal wear by Miss Ayshe. Other great designers are Huw Roman Tokyo (Japan), Fllumae (USA), Mizaan (Germany), Yours Truly, (Canada), Sumayya & SSS (Indonesia), Zeina Ali (Jordan), aere (Malaysia), Anotah (Kuwait). DMFW also features many local talents like The College of Fashion and Design presents Sara Al Madani, Samah Shublaq, Studio Teh and many more. Doris Dorothea presents attractive show featuring influencers from around the world- showcasing unity in diversity. A special awarding ceremony for the winners of Emerging Modest Fashion Designer Award by The Modist also taken place in DMFW. DMFW is held in partnership with Emaar, Modanisa (Name Partner), MBM International (Platinum Partner), Dubai Culture (Culture Partner), Dubai Islamic Economy and Development Centre (Supporting Partner), Rewaq Ousha Bint Hussein-Cultural Center (Supported by), Thomson Reuters (Knowledge Partner), Wardah Beauty (Make-Up Partner), Doris Dorothea (Bag Partner), The College of Fashion and Design Dubai (Education Partner), The Modist (EMFDA Partner), Ajmal Perfumes (Fragrance Partner), OVLAJ (Skin Care Partner), Ijmal (Hair Partner), Bash Ahmad (F&B Partner), The Lipstick Make Up Institute (Silver Partner) and Voss Water (Water Partner).